If you've been using our 14-day free trial and want to take advantage of the benefits our paid plans offer (like zero Podia fee, unlimited paid products, drip email marketing, etc), you've come to the right place! 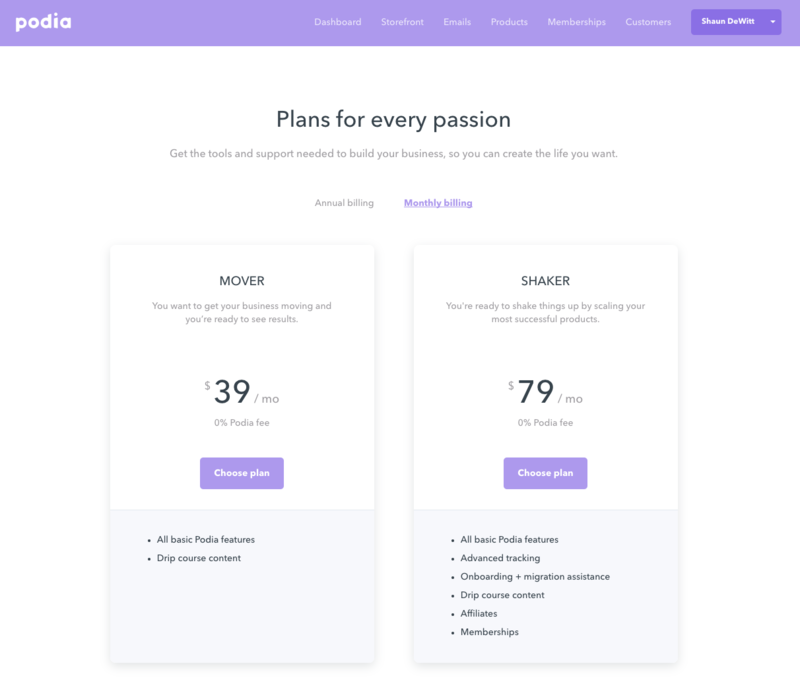 Step 2: Once inside billing, you can review the two paid plans (Mover and Shaker). To see the difference between a monthly and annual plan, use the tabs to toggle between each option (just FYI: annual plans will get you two months free!). When you've made a decision on a plan, press the green "Choose plan" button beneath the plan name to select it. Step 3: After selecting the plan you want, a pop-up window will appear with the plan details as well as an area for you to enter your credit card information. When all the right information is filled in, click on the purple "Confirm" button to finalize your plan. You're now enrolled in your Podia plan! If you have any additional questions or need help, email us at [email protected] or click the chat icon below.